Sachin Ramesh Tendulkar is one of the greatest batsman of all times. Sachin started playing cricket when he was 11 year old, he made test debut at age of 15. Sachin Tendulkar has played for Indian national team for 24 years and played important role in their success. Sachin is the only player to score 100 centuries in international cricket. He is the highest runs scorer in both ODI and Test matches. Tendulkar retired from one day international cricket in 2012 and continue to play test cricket. Sachin Tendulkar retired from all format of international cricket in September 2013. Sachin is the only batsman who has scored over 30,000 international runs. This article is dedicated to Indian greatest cricket legend Sachin Tendulkar. 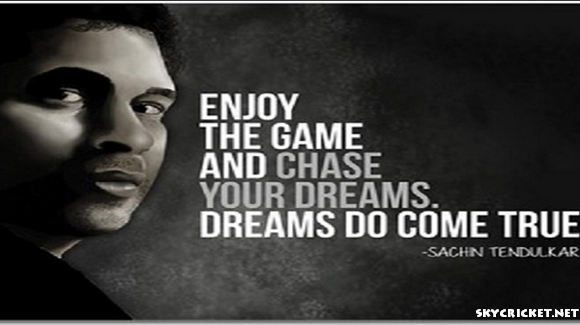 We have included some inspirational quotes by Sachin Tendulkar. 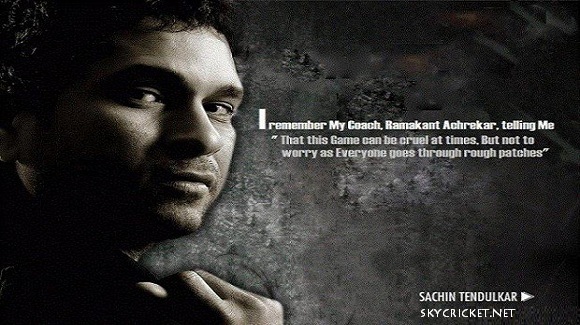 He went through some rough patches during his international career and some of Sachin Tendulkar quotes will represent such an experience and it provides guidelines to others who might struggle some day in their lives. Sachin Tendulkar quotes about success, failure, Pakistani players, dreams and motivations are part of Sachin Tendulkar cricket quotes. 1. Any active sportsman has to be very focused; you've got to be in the right frame of mind. If your energy is diverted in various directions, you do not achieve the results. I need to know when to switch on and switch off: and the rest of the things happen around that. Cricket is in the foreground, the rest is in the background. 2. I want to give my six hours of serious cricket on the ground and then take whatever the result. 3. I am a sportsman and not a politician. I am a sportsman and will always remain one. I am not going to enter politics giving up cricket, which is my life. I will continue to play cricket. 4. But eventually it is a game of cricket. 5. Before you lay a foundation on the cricket field, there should be a solid foundation in your heart and you start building on that. 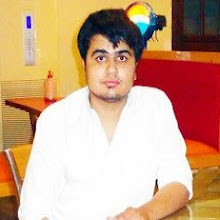 After that as you start playing more and more matches, you learn how to score runs and how to take wickets. 6. I hate losing and cricket being my first love, once I enter the ground it's a different zone altogether and that hunger for winning is always there. 7. Isn't cricket supposed to be a team sport? I feel people should decide first whether cricket is a team game or an individual sport. 8. Schools across India do not have teachers, libraries, playing grounds and even toilets. I do not want to see empty classrooms, empty libraries. I do not want to see cattle grazing on fields meant to be cricket or football grounds. 9. My point of view is that when I am playing cricket I cannot think that this game is less or more important. 10. When I was 15, I started playing first class cricket and always dreamt of being a Test cricketer, wanted to do something for the country, married in 1995, have 2 kids it's been great. 11. If one man is representing India in cricket, then yes, blame that person when things go wrong. 12. When there is time to think about cricket, I think but when there is time to be with family, I try to do justice to that aspect of my life as well. 13. Critics haven't taught me my cricket, and they don't know what my body and mind are up to. 14. I feel when somebody has been playing cricket for a long time, he creates a separate identity for himself. 15. I feel when somebody has been playing cricket for a long time, he creates a separate identity for himself. 16. Beating Pakistan is always special because they are a tough team and we have a bit if a history regarding Pakistan. 17. And that is the reason why this victory is great, because different players have made contributions to the win. 18. When there is time to think about cricket, I think but when there is time to be with family, I try to do justice to that aspect of my life as well. 19. Wasim and Waqar were amazing bowlers. I would put them right up there with the best in the world. 20. From the spinners, Anil and I have been together for a long time and I respect him a lot. 21. Son, life is like a book. It has numerous chapters. It also has many a lesson in it. It is made up of a wide variety of experiences and resembles a pendulum where success and failure, joy and sorrow are merely extremes of the central reality. The lessons to be learnt from success and failure are equally important. More often than not, failure and sorrow are bigger teachers than success and happiness. 22. If you remain humble, people will give you love and respect even after you have finished with the game.